Engine building is a big subject in the performance industry. Hot rods, racecars, motorcycles and any other performance machine you can think of have engines that are designed and built for specific purposes. In fact, there are countless articles and even entire magazines devoted to aftermarket parts that make engines bigger, faster and stronger. What about the engines that start up every morning and bring us to work and never complain? How is the tireless D16 in my Honda Civic that struggles to get up a hill when the air conditioner is on any different than the 900-horsepower monster in Scott Douglas’ race truck? As far as the basic building process is concerned, there is no difference. Whether made for a race, car or a passenger car, an engine needs to be assembled and broken-in before it can do its job. While your daily commuter comes broken-in, many racers and performance enthusiasts build and break-in their own engines on a regular basis. AMSOIL recently launched two new products designed for the assembly and break-in of new or rebuilt engines, giving customers the ability to build and run an engine using AMSOIL products exclusively. Engine assembly is a meticulous process. Parts must be clean, and bolts must be torqued to specifications or catastrophic failure could result. Engine builders generally develop their own process for engine assembly with the details in mind and seldom deviate from it. The same goes for the lubricants they use. If an engine builder finds a product that works he becomes dedicated to that product. I know this because I built engines in a previous life. The process starts with assembly lube. Assembly lube is applied to the main bearings before the crankshaft is laid in the block and torqued in place. This ensures the crankshaft is lubricated as it is moved during assembly and during the first few seconds when the engine is started. Piston installation is next. Assembly lube is applied to the rod bearings, the piston is slid into the cylinder and the rod is bolted in place on the crankshaft. Here again the assembly lube is critical to protect the rod bearings during assembly and initial startup. Camshaft installation usually follows. Many camshafts come with their own dedicated lube. If not, AMSOIL Assembly Lube can be used liberally on all areas of the cam before it is installed. This completes the rotating assembly, which will sit as the rest of the engine is assembled, so it is imperative the lube stays in place. AMSOIL Assembly Lube uses very high viscosity oil and a tackifier agent to ensure it clings to engine parts. The heads can be installed next and the valvetrain can be adjusted. Assembly lube is used on the lifters, rocker arms and push rods. At startup, oil reaches this area of the engine last, but pressures can be very high. Assembly lube must have strong anti-wear properties to keep the parts from wearing without much help from the engine oil for the first few seconds an engine is run. Engine Break-In is as delicate a process as it is a subject of conversation; ask 10 different engine builders about their Break-In procedures and you will likely get 10 different answers. You will, however, find some basic similarities. Engine Break-In can be defined as the seating of the piston rings to the cylinder walls. A honed cylinder and a new set of rings have microscopic peaks and valleys on their surfaces. The goal of the Break-In process is to file the peaks and valleys down to allow the ring to seal to the cylinder wall. Without a good seal the fuel/air charge can slip past the rings during the compression and power strokes of the combustion cyclefi leading to lost power and poor efficiency. In the racing and performance industry rings must seat quickly. AMSOIL Break-In Oil is designed to allow “controlled wear” in the cylinder to speed the seating process. This is accomplished through base oil technology. Camshafts need to be broken-in as well. After the engine has run for 15 minutes the cam and lifters will be matched, similar to how the rings are matched to the cylinder walls. The cam will also be heat, cycled and hardened, and oil additives play a key role in this area. Break-in oil must contain high levels of zinc and phosphorus (ZDDP) in order to protect the delicate cam lobes and lifters during the 15-minute break-in process. Without (ZDDP) metal-to-metal contact occurs and the cam lobes can be rubbed off. Roller cams are less sensitive but should still be monitored carefully during the first minutes after the engine comes to life. Engine break-in can be monitored by measuring cylinder leakage, tracking horsepower numbers or watching the oil blow-by residue in the exhaust port shrink as the engine is run. This unique process requires unique oil, and AMSOIL break-in Oil is right for the job. It contains very high amounts of ZDDP for cam and lifter protection, yet uses a conventional base stock to promote quick ring seal. With the engine built and broken-in all that is left is to select an AMSOIL product for use. For the track, we recommend Dominator® Synthetic Racing Oil; for the street, we recommend Z-ROD™ Synthetic Motor Oil. Frictional losses account for big part of fuel energy inputs. Minimizing friction in the engine and drivetrain can boost mpg. With prices at the pump hovering around $4 a gallon and projected to hit $5 a gallon, drivers are looking for solutions to improve fuel economy through every available avenue. Concerned drivers can do a number of things to ensure optimum fuel economy, including keeping tires inflated to the correct pressure, removing excess weight from the vehicle and backing off on the accelerator. Regardless, internal combustion engines are inherently very poor for overall efficiency. With so many moving parts constantly in close contact, much of the energy input is lost in the engine and more is lost downstream in the drivetrain components. In fact, very little energy from fuel ever reaches the wheels to propel the vehicle. According to the U.S. Department of Energy, 62.4 percent of the fuel energy from your tank ends up as engine losses. Additionally, of the 18.2 percent of the original fuel energy that makes it to the drivetrain, 5.6 percent more is lost before it ever reaches the tires, due mostly to frictional losses. So out of every one gallon of fuel you pump into your gas tank, 0.624 gallons disappear as heat and frictional losses, an additional 0.172 gallons is lost to idling and standby, and 0.022 gallons go to running car accessories like air conditioning. When it’s all said and done, you’re left with a mere 0.182 gallons to power the drivetrain. Of this very small amount of the starting gallon of fuel, an additional 0.056 gallons are lost to drivetrain friction, leaving only 12.6 percent of the starting gallon of fuel to turn the wheels. The remaining energy not consumed by aerodynamic drag on the vehicle body, rolling resistance of the tires, and brake losses goes to moving the vehicle. As a manufacturer of synthetic lubricants, reducing friction is a core part of most everything we do at AMSOIL. Because the combined energy losses from the engine and drivetrain use up 68 percent of every gallon of fuel, it makes sense that reducing friction by improving lubrication will have a measurable impact on overall fuel economy. So how does reducing frictional losses relate to a fuel economy improvement using this documented Department of Energy data? If you could cut overall engine losses in the original scenario by, for example, 0.50 percent (62.4 percent to 61.9 percent), 18.7 percent of the energy would reach the drivetrain vs. 18.2 percent. If you cut losses in the drivetrain by the same 0.50 percent (5.6 percent to 5.1 percent), a total of 13.6 percent of the total fuel energy would be available to move the vehicle, compared to 12.6 percent from the original example. This results in a total fuel economy improvement of 7.9 percent. So a 2010 Ford Fusion that gets 24 mpg consistently in the city would get 25.9 mpg in this scenario by reducing frictional losses in the engine and drivetrain. Vehicle manufacturers are and will continue to be under significant pressure to improve baseline fuel economy. In addition to implementing technologies like variable valve timing and lift, turbocharging, direct fuel injection and cylinder deactivation, vehicle manufacturers are actively looking for engine lubrication improvements to squeak out any additional fuel economy improvement possible to meet CAFE requirements. New technologies are being developed in vehicle drivetrain systems as well, including continually variable transmissions (CVTs), automated manual transmissions (AMTs), dual-clutch transmissions (DCTs) and AT step improvements, all focused on reducing the losses outlined in the example. The constant common enemy still faced in all these technologies is friction, and synthetic technology is the main weapon to fight this battle. Synthetic oil molecules are more uniform and predictable in terms of overall performance because they are engineered to produce specific results. Conventional oil molecules are much less predictable and contain many different fractions. They are not engineered, and as a result, they do not perform as well as their highly engineered synthetic cousins. Since friction is always the enemy at AMSOIL, we continually research, formulate and validate the most advanced friction-reducing ingredients we find worldwide to create products that give consumers not only outstanding engine protection, but fuel economy improvements that leave money in their pockets to have fun on the weekends. Because they work to suspend contaminants and by-products of combustion, it is not uncommon for gasoline and diesel oils to become dark. It may be more noticeable in some applications. It does not mean the oil is failing or must be changed. Fortunately, a number of different tools are available that measure motor oil’s condition and its ability to continuously protect and perform its other key functions. When motor oil exceeds its useful life or is impacted by a mechanical defect, it most commonly becomes too thin to separate metal parts, too thick to pump or too acidic for continued use. When oil becomes too thin, it fails to provide the required oil film thickness to separate metal surfaces. Different engine designs require different starting oil thickness or viscosity. Viscosity at 100 °C is one of the most highlighted oil properties and is a good indicator of adequate oil film thickness in an engine at operating temperature. A number of things can cause engine oil to become too thin to protect engine parts. Excessive mechanical shear can thin oil to the point of causing issues with engine protection. As motor oil cycles through the engine, it is exposed to shear stress in the engine’s upper end, piston walls and bearings that reduces its shear strength. Continuous exposure to these conditions causes oils built with inferior shear stability to thin excessively, leaving critical engine parts susceptible to metal-to-metal contact. Fuel contamination of the oil sump is another major cause of excessively thin engine oil. Both gasoline and diesel fuel are thinner than engine oil and when mixed, the oil’s viscosity, film thickness and ability to separate parts are significantly reduced. While a small amount of fuel dilution is relatively common and does not have a material impact on oil life, excessive fuel dilution in mechanically compromised equipment is much more harmful. When it comes to oil, although it may seem like “the thicker, the better,” oil that is too thick is just as detrimental as oil that is too thin. Excessively thick oil is the most commonly discussed oil failure and the subject of many big oil company marketing campaigns. When oil becomes too thick to flow to engine parts, these areas are starved of oil, resulting in metal-to-metal contact that can lead to catastrophic engine damage. The precursor to sludge is oil that has become much thicker than its original design. The cause is a complex chemical reaction involving heat, combustion byproducts and oxygen combining to create chemical attack on the oil molecules. The resulting chemical reaction creates a much thicker substance that does not flow or protect as well as the original oil. When the reaction continues, sludge begins to form in areas of higher localized temperature and low flow. While some varnish is normal, sludge is a sign of excessively degraded oil that needs to be replaced. In order to inhibit sludge and varnish, the oil must resist attack by oxidation forces. Synthetic base oils have a much higher level of saturated molecules that inherently resist this constant bombardment. Additionally, antioxidants are added to either reduce the formation of free-radical oxidation precursors or soak up these precursors once they form. Another cause of oil thickening, primarily affecting diesel oils, is excessive sootloading in mechanically unsound engines. Diesel oils are designed to handle some soot contamination, but when the soot overloads the available dispersants in the oil, the oil thickens. The agglomerated soot particles reach a critical size and cause excessive wear commonly seen in diesel liners. Acids are a normal by-product of burning fossil fuels. Different fuel types, engines and combustion conditions create varying levels of acid formation. These acids, transferred via blow-by gases, are carried away to the engine oil. Oils are designed with a detergent that neutralizes these acids before they accumulate and cause engine damage. The detergent level is measured with a test called Total Base Number (TBN). This measure of alkalinity drops over the life of the oil and reaches a critical level when the oil can no longer consume the acids created by combustion. When TBN reaches a critical level, acids build up quickly and attack the surfaces most susceptible, including yellow metals and lead-lined bearings. Without correction, this condition quickly worsens and results in excessive chemical wear. Although less common, this failure mode can cause significant damage if left uncorrected. AMSOIL synthetic motor oils are formulated to provide a broad level of overall protection, evidenced by guaranteed extended drain intervals. Synthetic base oils help resist oxidative decomposition, and a properly balanced, high-quality additive package helps keep contaminants in check and engines running for a long time. The AMSOIL Technical Services Department gets a lot of questions related to SAPS and why it is important. SAPS is an acronym for sulfated ash, phosphorus and sulfur, the three inorganic additives that provide key performance properties to a lubricating fluid’s detergency, wear protection and oxidation resistance. Total base number (TBN) and sulfated ash have had a strong correlation in past oil formulations, so most of us associate a lubricant’s SAPS levels with its starting TBN level. The appropriate level of SAPS for lubricants has been the subject of debate for the past few years. Lubrication engineers attempt to formulate oils that provide a high level of resistance to acid formation while limiting one of the main acid-neutralizing additives in order to protect exhaust aftertreatment devices. So, what exactly does SAPS do? While SAPS has outstanding engine protection properties, too much can be detrimental to exhaust after treatment devices. First, let’s understand the “SA” in SAPS. Sulfated ash is a term used for materials added to lubricants to soak up excess oxidation byproducts and acids created by exhaust gases. Sulfated ash is an important component of diesel oil to ensure long oil life and good engine protection over time. As noted, some oil specifications restrict the sulfated ash content in order to protect certain emissions aftertreatment devices. The diesel particulate filter (DPF) is a good example of an emissions system device and is a relatively new development in the diesel world. The DPF is a large, honeycomb-type filter designed to capture and burn soot in diesel applications. It filters particulate matter from the exhaust so we don’t have to breathe in harmful material from buses, trucks and other diesel applications. As the DPF fills with contaminants, pressure builds within the exhaust system. When the pressure reaches a certain level it triggers a DPF regeneration process where soot particles are burned. Materials that don’t burn, like sulfated ash, build up in the filter over time and block the flow of exhaust through the filter. When ash build-up becomes excessive, it must be professionally cleaned. The latest diesel oil specification for 2007 and newer diesel vehicles, API CJ-4, limits the level of sulfated ash for this reason. It is normal and accepted that these filters need to be cleaned, but the new CJ-4 specifi cation limits sulfated ash levels to prolong time between cleanings. Many European vehicles come equipped with smaller DPFs that do the same job as their large diesel counterparts, which is why the VW 504.00/507.00 engine oil specification limits an oil’s sulfated ash content. AMSOIL European Car Formula 5W-30 Synthetic Motor Oil (AEL) has a lower TBN than many other AMSOIL products in order to meet the VW 504.00/507.00 SAPS restrictions. VW specifies precise SAPS limits, which limits the level of resulting oil TBN. Now for the “P” portion of SAPS. Phosphorus is a component of what is commonly recognized as an anti-wear agent and oxidation inhibitor, zinc dialkyldithiophosphate (ZDDP). ZDDP is very prevalent in the lubrication industry due to its excellent anti-wear and antioxidant properties. Alternatively, larger quantities of volatile phosphorus contained in ZDDP have been linked to premature poisoning of the catalyst surface of three-way catalytic converters and is a primary reason phosphorus has been limited in certain oil specifications. The VW 504.00/507.00 oil specification limits phosphorus content to help prolong catalytic converter life. While higher phosphorus levels can reduce catalytic converter life, a low-SAPS lubricant is engineered to provide emissions system compatibility in both gas- and diesel-fueled vehicles. The last “S” in SAPS stands for sulfur. Sulfur compounds are typically associated with anti-wear and extreme-pressure protection, but they can also be a component of corrosion inhibitors, friction modifiers and antioxidants. Excess sulfur can contribute to catalyst poisoning because sulfur is preferentially absorbed by the catalyst sites. When sulfur gets into the exhaust stream, it can poison catalyst surfaces, resulting in formation of particulate matter. Particulates in the emissions system can increase system back-pressure that negatively affects vehicle performance. Sulfur is generally being reduced in diesel fuel and lubricants. There are a number of very positive benefits of SAPS in lubricants; however, as government emissions legislation imposes stricter emissions limits, the latest and forthcoming oil specifications require reduced SAPS levels to improve the life and performance of exhaust aftertreatment devices. New materials are continually being developed that provide performance functions similar to SAPS, yet help overcome the detrimental effects SAPS can have on emissions treatment systems. AMSOIL continues to be at the forefront of evaluating new SAPS-replacement materials, and we are challenging the industry on SAPS limits that don’t make sense for consumers. While torque and horsepower ratings are common vehicle selling points, many consumers don’t fully understand what the ratings mean or the relationship between the two. Most often measured in pound-feet (lb-ft), torque is a twisting or turning force applied to an object such as a wheel, crankshaft or nut. When tightening a nut with a wrench, for example, the level of torque placed on the nut is determined by multiplying the force applied at the end of the wrench by its length. Applying 100 pounds of force at the end of a one-foot wrench translates into 100 lb-ft of torque, while applying the same amount of force at the end of a two-foot wrench translates into 200 lb-ft of torque. 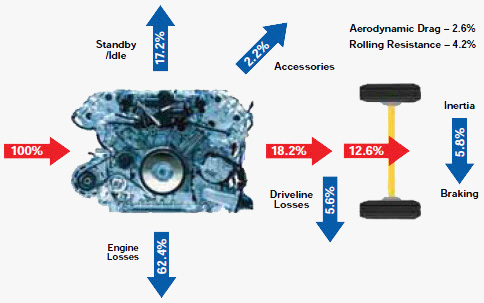 In automotive applications, torque measures the engine’s ability to perform work. The torque created by displacement of engine cylinders spins the engine crankshaft, and the transmission applies this torque to the wheels of the vehicle, moving it forward. The more torque applied to the crankshaft, the more work the vehicle can do. While torque measures the turning force produced by a vehicle’s engine and measures the engine’s ability to perform work, horsepower measures how fast the engine can perform the work. Engine horsepower ratings indicate how much power an engine can produce similar to how light bulb wattage indicates how much power the bulb will use. Steam engine inventor James Watt coined the term “horsepower” in the 18th century for the purpose of comparing steam engine performance to the better-understood performance of horses, which were used as the power sources for everything from transportation to plowing fields and pumping water. It’s believed Watt arrived at the now-standard 33,000 lb-ft per minute (550 lb-ft per second) figure for one horsepower by measuring how quickly a horse turned a gear-driven mine pump and estimating the amount of force the horse exerted to perform the work over a given time. Plugging various RPM values into the equation provides an idea about the range of power an engine can produce. Because torque and RPM are divided by 5252, torque and horsepower are equal when the engine speed is equivalent to 5252 RPM, while torque is greater than horsepower below 5252 RPM and horsepower is greater than torque above 5252 RPM. The level of horsepower an engine can deliver is directly proportional to the level of torque generated by the crankshaft, which is directly proportional to the total displacement capacity of the engine. Because there is a limitation on the maximum displacement an engine can generate, there is also a limitation on the amount of torque the engine can produce, which in turn sets a limit on the engine’s maximum horsepower. While it’s been hotly debated whether torque or horsepower is more important, it just depends on the driver’s priorities. A vehicle with a higher torque value can perform more work, providing an advantage for pulling trailers or hauling heavy loads, while a vehicle with a higher horsepower value performs work faster, making it bettersuited for highway driving or racing. Viscosity is one of the most important yet misunderstood physical properties of a lubricant. Most consumers don’t understand the true nature of multi-viscosity lubricants. Without a thorough understanding of viscosity tests and classification systems it is difficult to explain the specific reasons different applications and conditions call for different lubricants. Viscosity is defined as a fluid’s resistance to flow, and some fluids have a higher viscosity than others. For example, honey is much more viscous (flows more slowly) than water. Most vehicle owners understand their application requires a specific viscosity grade and type of oil, and that those details are usually outlined by the original equipment manufacturer (OEM) in the owner’s manual. But what do these different viscosity recommendations really mean? What is the difference between 5W-30 and 10W-30 engine oil? First, there is no difference between a 5W-30 oil and a 10W-30 oil when the engine has warmed up – the second number of a multi-viscosity oil represents the oil’s thickness at operating temperature. So, a 5W-30 oil and a 10W-30 oil both have the same viscosity (resistance to flow) when the engine is running. It is the number before the dash that differentiates them. This number, known as the winter viscosity grade, tells us what the oil’s thickness will be when the engine starts, when it is cold. The smaller the “W” number, the easier an engine starts in cold temperatures. So, a SAE 5W oil is less viscous and will flow more easily than a SAE 10W oil in cold temperatures at startup and during warm-up. Most engine wear occurs at this critical time because of insufficient oil flow. There are a number of different viscosity grading and classification systems used for lubricants. One of the most common systems is the SAE J300 viscosity grading system for engine oils. This table outlines specific requirements for viscosity at different temperatures and shear conditions. So to determine the difference between 10W-30 and 5W-30 engine oil, we first need to understand two basic viscosity measurements and the shear test used to measure the viscosity stability of engine oils. The most common measurement of viscosity is Kinematic viscosity, which is measured at 100°C (212°F) – close to the maximum operating temperature for most passenger car and truck applications. This test measures how fast an engine oil is pulled by gravity through a glass tube heated to 100°C. The time it takes for the oil to move through the tube is converted to a viscosity measurement called centistokes (cSt). The SAE established categories of oil based on this measurement. To obtain the 30 in 5W- 30, 10W-30 or any other SAE 30 weight designation, the Kinematic viscosity at 100°C must be at least 9.3 cSt and no more than 12.5 cSt. In addition to Kinematic viscosity requirements, each viscosity classification has high-temperature/high-shear (HT/ HS) requirements. The HT/HS test simulates an engine at operating temperature and under load to measure how well oils maintain thickness over time. It is determined at 150°C (302°F), and a SAE 30-grade oil has a minimum HT/HS viscosity requirement of 2.9 cSt. So, how is the winter viscosity grade determined? This cold-temperature designation uses another viscosity measurement called Brookfield viscosity. Brookfield viscosity is measured in centipoise (cP) at designated temperatures for each W rating. Using the honey example, Brookfield viscosity simulates stirring a bowl of honey and measuring the amount of resistance to stirring in the bowl. Thicker honey takes more energy to stir, and honey becomes thicker the colder it gets. For a 30-weight oil to also qualify for a 10W rating, the Brookfield cranking viscosity (ASTM D-5293) cannot exceed 7,000 cP measured at -25°C (-13°F), and the Brookfield pumping viscosity (ASTM D-4684) must be less than 60,000 cP at -30°C (-22°F). Alternatively, in order to qualify for a 5W rating the Brookfield cranking viscosity cannot exceed 6,600 cP measured at -30°C, and the Brookfield pumping viscosity must be less than 60,000 cP at -35°C (-31°F). Several other viscosity classification systems are used to designate different grades of lubricants. Another common system is the SAE J306 system, which defines automotive gear, axle and manual transmission lubricant viscosities and incorporates both the SAE rating and winter viscosity requirements similar to the SAE J300 engine oils system. Industrial fluids generally use a system designated D 2422-97, which separates different industrial fluids into different ISO viscosity categories. These categories are commonly referred to as ISO viscosity grades and run from ISO VG 2 through ISO VG 3200 (ISO stands for International Organization for Standardization, VG stands for viscosity grade). A common hydraulic fluid viscosity grade is ISO VG 46, where the mid-point Kinematic viscosity at 40°C (104°F) is 46 cSt, and the range to qualify for this viscosity category is 41.4 to 50.6 cSt. On the surface, viscosity may seem like an easy concept to understand, but most consumers don’t really know where to start. Different rating systems are used for passenger car motor oils, gear lubes and industrial lubricants. Although it is not necessary for Dealers to know all of the technicalities, a basic understanding is important in order to make correct viscosity recommendations for customers. ATF additives can alter automatic transmission fluid properties, causing degraded low-temperature performance, premature wear, corrosion and shudder problems. Original equipment manufacturers (OEMs) perform extensive testing to determine the lubrication characteristics required for specific transmission designs and applications. OEM engineering specifications outline the physical properties and minimum performance levels of the required fluids, and only a well-formulated automatic transmission fluid that meets these OEM specifications ensures proper transmission function and maximum service life. In the past, a few major OEM specifications covered the transmission fluid requirements for the entire industry. Today, numerous different specifications have led to confusion and inconvenience for consumers, especially for those who own vehicles from different manufacturers. Installers face similar issues; keeping an inventory of different fluids may be confusing and expensive. To simplify matters and reduce costs, many transmission fluid installers rely on ATF additives to fortify used fluid, “update” less expensive outdated fluid or add an extra level of protection. In fact, a recent study revealed 53 percent of surveyed shops used additives to enhance “DEXRON®/MERCON®” ATFs. Claims by ATF additive manufacturers lead consumers to believe the additives provide everything transmissions need to perform well and last longer. Despite such claims, however, most vehicle and transmission OEMs specifically warn against using them. Not only are the benefits usually short-lived, but the additives can actually degrade the performance of the automatic transmission fluid. The following test data from industry studies demonstrates the shortfalls of a typical ATF additive in three critical performance areas. The data also identifies a situation where the ATF additives degraded the performance of the original fluid enough that it no longer met the requirements of the specification for which it was designed. To function properly, the friction surfaces in an automatic transmission and locking torque-convertor must slip enough to engage smoothly and then firmly lock to transmit power without slippage. Well-formulated automatic transmission fluids contain carefully designed friction modifier additives that effectively promote this process over the recommended fluid life. If the required frictional performance level is not met, the clutches and other friction surfaces slip and lock intermittently under load, causing shudder that contributes to inefficiency and potential transmission problems. ATF additive manufacturers attempt to address shudder issues by formulating their products with highly frictionmodified additives. As the modified SAE Severe Anti-Shudder Durability test (Chart1) shows, ATF additives may initially boost anti-shudder performance, but the benefit is short-lived. In less than an hour, the anti-shudder performance level of the base ATF treated with an ATF additive began to decline, and within 1.5 hours fell below the minimum performance reference line. In contrast, the ATF without an ATF additive maintained its ability to resist shudder for close to six hours. The FZG Wear Test (ASTM D-5182) is used to gauge resistance to scuffing loads common in automatic transmissions. At each stage, a progressively heavier load is applied to a set of gears, and scuffing of the gears is evaluated. The lubricant protecting the gears will either pass or fail the load stage based on this evaluation. 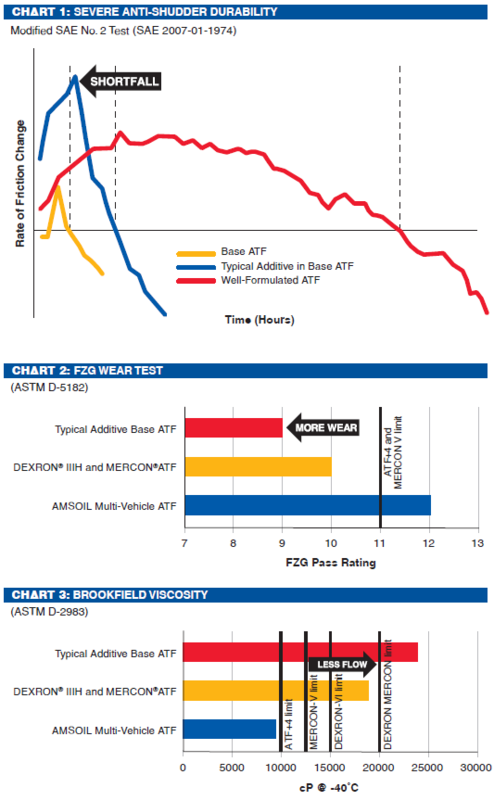 The negative effect ATF additives can have on transmission fluid is clearly demonstrated by the test results (Chart 2). While the untreated DEXRON IIIH/ MERCON transmission fluid produced an FZG pass rating of 10, the addition of an ATF additive interfered with the original fluid’s designed protective properties and lowered the rating to 9. In contrast, AMSOIL Synthetic Multi- Vehicle Automatic Transmission Fluid produced an FZG pass rating of 12, surpassing virtually all OEM specification requirements. Vehicle manufacturers specify maximum cold-temperature transmission fluid viscosity limits to ensure adequate lubrication at startup and proper shift performance in cold weather. The Brookfield Viscosity Test (ASTM D-2983) is used to measure fluid viscosity at low temperatures. A measurement at -40°C ATF additives can alter automatic transmission fluid properties, causing degraded low-temperature performance, premature wear, corrosion and shudder problems. M A G A Z I N E JANUARY 2011 | 9 (-40°F) is a common transmission fluid specification requirement, and the result of the test is expressed in centipoise (cP). The higher the cP, the more the fluid resists flow. The maximum Brookfield Viscosity limits at -40°C for four OEM transmission fluid specifications are indicated in Chart 3. The untreated DEXRON IIIH/MERCON transmission fluid alone met the DEXRON/MERCON Brookfield Viscosity requirement. However, when an ATF additive was added, it failed to meet the requirement, demonstrating clear evidence of ATF additives negatively interfering with the properties of automatic transmission fluid. 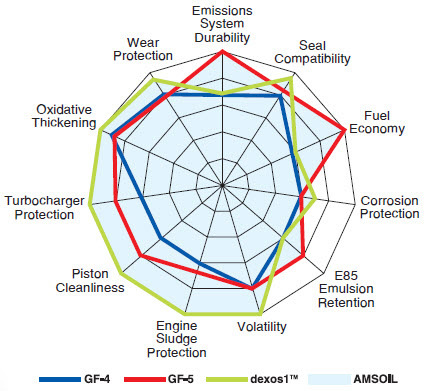 AMSOIL Synthetic Multi-Vehicle ATF meets the Brookfi eld Viscosity requirements of all the specifications displayed in the graph, demonstrating that a premium-quality, multi-vehicle transmission fluid is the optimal choice when a single product must satisfy the requirements of multiple specifications. AMSOIL INC. recommends against the use of ATF additives as they may cause a reduction in performance, protection and longevity of equipment, and can ultimately cause permanent damage to a vehicle’s transmission. 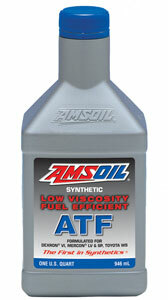 The use of any aftermarket ATF additive will void the AMSOIL Limited Warranty. AMSOIL Synthetic Multi-Vehicle Automatic Transmission Fluid (ATF) and Synthetic Fuel Efficient Automatic Transmission Fluid (ATL) are highquality transmission fluids engineered to the highest performance requirements of multiple transmission fluid specifications. AMSOIL transmission fluids are multi-vehicle products that accomplish the objective of additives without degrading performance. They effectively reduce confusion, inventory requirements, misapplication and cost, while providing superior protection to help extend transmission life. AMSOIL ATFs are warranted by AMSOIL for use in a wide range of domestic and import vehicle transmissions. With three major specifications now in play shows they continue to evolve, consumers are facing an increasingly complex market. The automobile industry is continually changing; between advancing technologies and increasingly stringent performance mandates, change is constant and essential. In North America, engine oil specifications have traditionally been governed by the American Petroleum Institute (API) and the International Lubricant Specifications and Approval Committee (ILSAC). The API first created engine oil groups in 1947 and has been continually improving engine oil specifications ever since. The API represents the interests of hundreds of oil marketers and defines oil service categories in addition to administering the Engine Oil Licensing and Certification System (EOLCS). There are currently two registered marks administered by the EOLCS: the API service symbol (donut) and the ILSAC certification mark (starburst). Certified oils carry one or both of the registered marks. Since the development of the “S” and “C” categories around 1969/1970, the API, the American Society for Testing and Materials (ASTM) and the Society of Automotive Engineers (SAE) have been working together to develop engine oils that meet changing performance demands. This diagram outlines the different areas of improved performance emphasized by GF-5 and dexos1. While each specification outperforms the other in certain areas, AMSOIL has formulated its oils to the highest standard of both specifications in all areas. In 1987, the Alliance of Automobile Manufacturers (AAM, formerly AAMA) informed the API that it was dissatisfied with the current approach for approval of motor oils and created a new system for approval governed by a new committee, ILSAC. ILSAC consists of nine original equipment manufacturers (OEMs) from North America, Europe and Japan. ILSAC recently developed the GF-5 oil standard, which improves performance over the previous standard, GF-4. The increased performance standards are achieved by mandating certain performance requirements; some of the main improvements have been aimed at fuel economy, engine oil robustness and emissions system protection. The API’s most recent service categories are SN and SN “Resource Conserving.” The API SN category applies to oils for gasoline-powered passenger cars, SUVs, vans and light-duty trucks. The API SN Resource Conserving category requires increased performance over SN and more closely matches the ILSAC GF-5 specifi- cation. 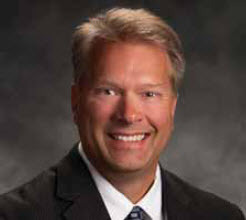 The API SN and SN Resource Conserving licenses were both introduced October 1, 2010. General Motors complicated matters a bit this year with the introduction of its dexos1™ oil licensing program. GM created the dexos1 oil specification to reduce the oil’s impact on the environment and increase its performance in certain categories. dexos1 has tighter performance requirements than GF-5/API SN in some areas and looser requirements in other areas. Consumers driving model-year 2011 and newer GM vehicles will have to be sure they use an oil recommended for dexos1 applications. Government mandates weigh heavily in the formulation of motor oils and the development of new service categories. Federal regulations for automotive performance, fuel economy and emissions limits are becoming increasingly stringent, requiring vehicle manufacturers and oil companies to develop technologies to meet these requirements. Vehicle manufacturers are developing new engines and emissions systems that meet the requirements, but they are also relying on oil manufacturers to help meet the new mandates. Governmentmandated corporate average fuel economy (CAFE) requirements are focused on improving the average fuel economy of vehicle manufacturers’ passenger car and light-truck fleets. The National Highway Traffic Safety Administration (NHTSA), together with the Environmental Protection Agency (EPA), monitors the fuel economy and emissions performance of vehicles. 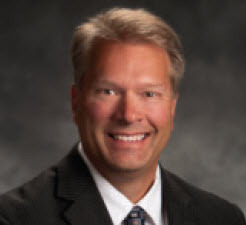 The average fuel economy of an OEM’s fleet of vehicles must meet the minimum CAFE standards or OEMs face costly penalties. With all these changes happening at the same time, it can be difficult to sort out all the updates and differences between specifications. AMSOIL simplified the situation for Dealers and customers by formulating motor oils that meet or exceed performance standards in each of the main categories. AMSOIL OE and XL Synthetic Motor Oils meet the API SN Resource Conserving and ILSAC GF-5 performance requirements; OE 5W-30 and XL 5W-30 meet the GM dexos1 performance requirement. The top-tier line of AMSOIL synthetic motor oils will be reformulated to meet the latest industry specifications in the first quarter of 2011.